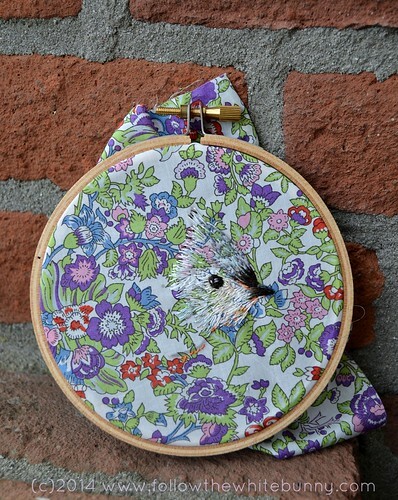 Anyway, I suddenly thought it might be fun to stitch it on a really pretty, flowery fabric. Lately I have only used cotton satin fabric for my tiny animal portraits. Cotton Satin is a medium weight fabric with a close weave and perfect for embroideries with lots of tiny stitches. Then I found this scrap of gorgeous Liberty Fabric in my stash which is really is not very suitable for my type of stitching at all. The fabric is quite thin and I can hardly see what I'm doing with that busy print but the embroidery is turning out rather charming so far. I really like how the bird seems to emerge from the flowers. Now I'm tempted to do more of these 'Liberty' birds after I have finished this one! I absolutely adore this! Can't wait to see more! Wow! Great idea! Tricky fabric indeed! How did you go about applying the basic image to the print or are you free-handing the whole thing? WOW! I sincerely adore it. This is wonderful!! So alive and vibrant. Fresh and totally you... with a twist.